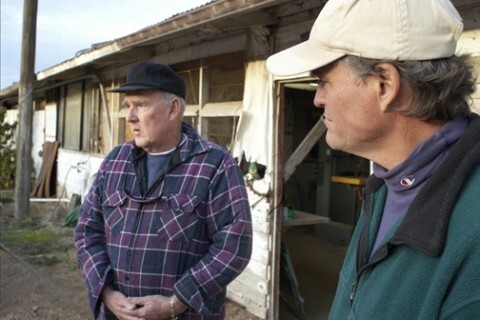 RAIDED : Henri DeGroot (left), owner of the 40-acre former chicken farm that was searched last month, and John Brigham (right), who operates a recycled furniture woodshop on the property, claim that there was something fishy about a recent raid. # A month after more than 30 sheriff's deputies, fire officials, and code enforcers stormed a defunct chicken farm north of Nipomo, the owner of the land and a man who runs a business on the site are claiming that the warrant the officials used in the raid was based on inaccurate information. Property owner Henri DeGroot and woodshop owner John Brigham said in interviews with New Times that the affidavit used to obtain the warrant was problematic. They cited issues they had with statements attributed to DeGroot and pointed to confusion regarding the land's zoning status. The latter stems back to a 2006 Board of Supervisors vote to change the property's zoning from agriculture to rural residential. Despite the vote, a county document requested by New Times still listed the land as zoned for agriculture. County Code Enforcement Chief Investigator Art Trinidade later told New Times that the land had been rezoned months ago, but the zoning report for the property wasn't updated. Such details aside, DeGroot and Brigham are also wondering what prompted a display of force at the December raid, one that witnesses said involved deputies intimidating Brigham's employees with guns and patting them down. At issue is a 40-acre property that includes 17 wooden buildings--former chicken coops--that have since been used as storage spaces, artist studios, various shops, and a commercial mushroom operation. Cal Fire Battalion Chief Andy Andersen, the author of the affidavit, staunchly rejects any claims of wrongdoing and further denies that excessive force was used. What force was used, he said, was justified. He points to the fact that the search turned up three people allegedly improperly living on the property. According to enforcement officials, one of them had 2 1/2 pounds of marijuana with him, and he and another man had outstanding warrants. But DeGroot said that several statements in the affidavit used for the warrant are untrue and that other facts are skewed. The most troubling of these for DeGroot is a statement attributed to him that he claims he never made. The line in question is hand written at the bottom of a page, marked with an asterisk. It reads: "On 12/09/07 the property owner, Henri DeGroot, told me the current use of the property was not permitted with the county of San Luis Obispo." "First of all," DeGroot began, "I never even talked to him on the 9th and I'd have to be out of my mind to tell someone that!" The quote does seem to go against other statements DeGroot has made concerning his property. In public comments and documents, he's consistently maintained that the current, non-chicken-rearing activities are grandfathered in, that at least some of them were sanctioned by the SLO County Board of Supervisors, and that his purchase of the property nine years ago hinged on the continued use of some buildings by tenants, including the mushroom farm and Brigham's shop. Both Brigham and DeGroot claim that they didn't see Andersen at the property on Dec. 9, but that he was at the property for several hours a week later on Dec. 16, two days after the warrant was issued. Andersen countered with a concise account of the events on the 9th, saying that he was accompanied by another investigator and that he had supporting evidence of his visit, including photos of the property dated Dec. 9. New Times has not seen the photos. He also said that DeGroot made a number of other statements that could have been used as evidence. Finally, Andersen said that he was off duty on Dec. 16. Both dates in question were Sundays. "Everything in there is the truth," Andersen said. "I'm not going to perjure myself in the affidavit." The most recent action seems to have kicked off when the fire department responded to a small fire on the property in October. Although the fire was out when officials arrived, firefighters reported finding what appeared to be living quarters on the land. That event spawned a two-month investigation and led to a warrant issued on Dec. 14, followed by the raid three days later and the subsequent condemnation of each building. Accounts of the raid diverged markedly in the weeks that followed, with some people who worked at the site describing it as akin to the imposition of martial law and Andersen recounting a "low-key building search." Immediately after the raid, in answer to accounts of displays of semi-automatic weapons and intimidation tactics by law enforcement, Andersen justified the show of force, citing a "meth bust" that occurred in the area around 2005. Andersen explained that, in the recent raid, three teams of 10 men each conducted sweeps of the 17 buildings. These men had weapons ready, according to earlier statements and witness accounts. In a more recent interview, Andersen said that while almost every officer who responded on Dec. 17 was armed, none of them drew their weapons. He also said that he couldn't provide any details of any meth bust alleged to have occurred on the property. DeGroot said it never happened. Andersen told New Times to get details from the sheriff's department, which referred the matter to the Narcotics Task Force. A representative of the force said he'd heard of a bust in his department, but hadn't seen record of it. More broadly, Brigham said that he resents the picture the raid painted of his business as an illicit operation running contrary to county rules and in violation of fire codes. His employees said they were intimidated with guns, patted down and frisked, and told to remove their personal items from the building because it was condemned and they were occupying it illegally. Days after the raid--which included at least 30 people from the sheriff's department or its drug task force, and officers from at least 10 other agencies--Cal Fire returned to the ranch to conduct an inspection of Brigham's shop and the mushroom farm, to help them identify risks and get up to code where necessary. At that time, Andersen said that the second inspection of the condemned buildings was in light of a 2006 Board of Supervisors' meeting, in which the board specifically allowed for Brigham's use of the buildings. Still, Andersen maintains that his agency has never backpedaled and holds that the facts behind the warrant are as true as ever. affidavit, however, states: "none of the buildings or any of the sub-structures within the buildings are licensed or permitted by the county of San Luis Obispo for occupancy or for business operations or activity." The Brigham crew has since been allowed back onto the property, and reported that no one from the county has been by since the raid to follow up on the numerous allegations of fire code violations--which the affidavit described as posing an "immediate threat to health and safety." So what does DeGroot think is behind the action? He floated a theory that amounts to harassment by code enforcement officials based on his attempts to develop the property without the blessing of the Nipomo Commmunity Services District or county planners. DeGroot said that he's currently navigating the tail end of a lawsuit that the district filed against him over zoning issues. "I think that it has to do with the Board of Supervisors' decision to change the zoning," DeGroot theorized. "I think there's some sort of vindictiveness on the part of the zoning department. All they had to do was call me, make an appointment, and I would have shown them each building, one by one."